M&M Tack Shop is donating $10 gift certificates for volunteers that can either be used online or at their store. M&M Tack Shop will be on the grounds during this competition. Southern States Cooperative is donating coupons for free bags of feed. Go to Volunteer Perks link for more information. M&M Tack Shop is donating $10 gift certificates for volunteers that can either be used online or at their store. M&M Tack Shop may be on the grounds during this competition. Southern States Cooperative is donating coupons for free bags of feed. Go to Volunteer Perks link for more information. M&M Tack Shop is donating $10 gift certificates for volunteers that can either be used online or at their store. M&M Tack Shop will be on the grounds during this competition. Southern States Cooperative is donating coupons for free bags of feed. 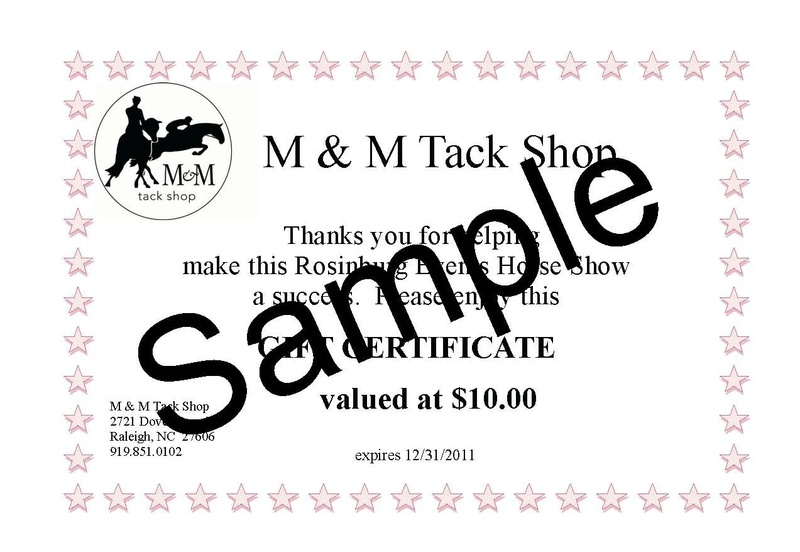 M&M Tack Shop is donating $10 gift certificates for volunteers that can either be used online or at their store. Southern States Cooperative is donating coupons for free bags of feed. M&M Tack Shop is donating $10 gift certificates for volunteers that can either be used online or at their store. M&M Tack Shop is donating $10 gift certificates for volunteers that can either be used online or at their store. M&M Tack Shop will be on the grounds during this competition. [Sample] Southern States Cooperative is donating coupons for free bags of feed.